Last week’s Gossip Girl episode, “It Girl, Interrupted,” brought many unexpected surprises, but probably none more exciting than the one, bold-hued piece of fabric covering our beloved Mr. Bass. Yes, Serena’s coat was a mosaic stunner, and yes, that Oscar de la Renta on Blair was the epitome of pretty, little, princess for the last time, but that onesie ... was priceless. Enough said. We usually don’t recap the fellas, but this time we’re making an exception. If you thought there was a rift between the two ships, then you haven’t seen the twitter sphere buzzing with rants and raves over this amazing getup of our favorite usually suited boy billionaire. 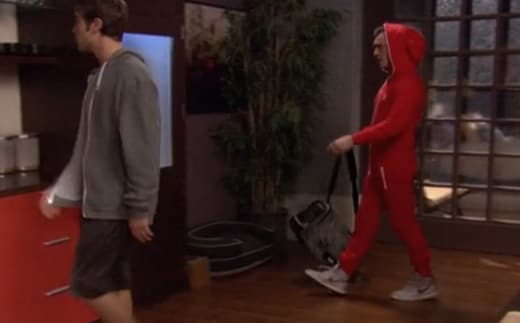 Chuck traded his pinstripes for a zipper and his oxfords for Uptowns in a bold red hooded onesie to play basketball with Nate. Magnificent. The man can do no wrong. Well, except for the orange trench coat in season 2; that was bad. It’s nice to see Serena get a little embellished every once and a while. Though her all-American look is beloved to her character, let’s not forget her rise to fame was partially due because of her fashion sense. The mosaic collar paired with the leopard was a sure kill—mixing and matching never hurt anyone. Another party, another sleek and slim black dress for Serena, before it all came off for the lingerie show. Cozied and cuddled in red and suede Louboutin booties made Lola look like the “people’s It-girl; someone that’s relatable” ... exactly what she wanted. Who’s gorgeous, confused, and pink all over - a befuddled Blair Waldorf, that’s who. Looking ery color coordinated she achieves this look with poise and grace during her last hours as a princess.